Ria Loves Pawlish: OPI Gone Gonzo! i decided to recycle yesterday's mani (China Glaze Blue Iguana) and add a glitter topcoat. OPI Gone Gonzo! looks perfect over it! 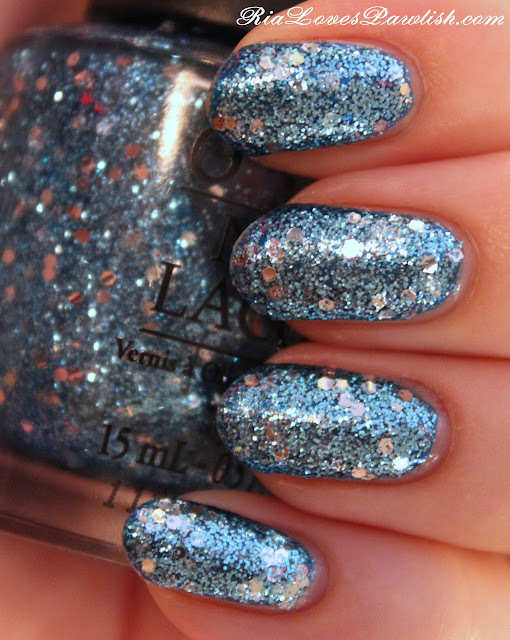 this glitter is very simple, comprised only of small light blue glitter and scattered large silver hex glitter pieces. over a blue base, it looked opaque in two thick coats! it dries fairly smooth, so i didn't even add a finishing topcoat over it. it does have a slight texture to it, so if you like your nails really smooth i would definitely go ahead with Seche Vite! i can't believe how much it sparkles inside on such a dreary day... which means it's crazy beautiful out in the sun! Love the blue on blue! So sparkly and pretty.